Missy has been with us for over thirteen years. 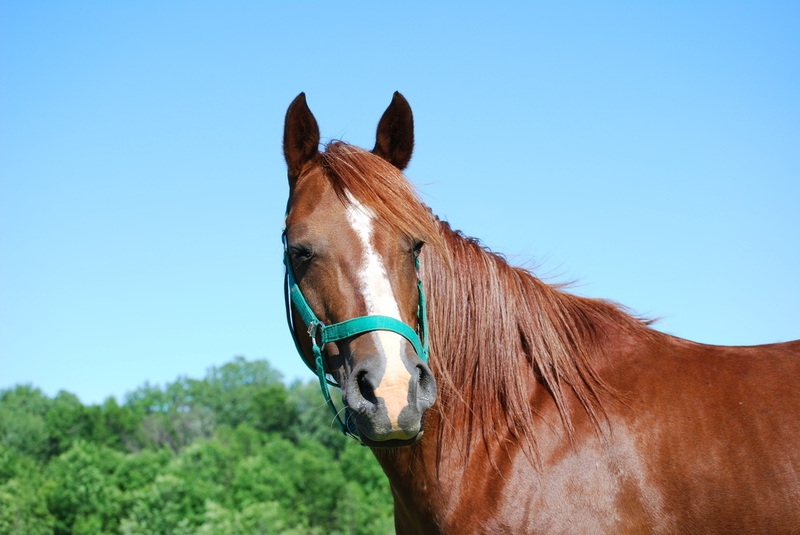 She was the first rescue horse we ever took that had DEEP psychological and fear issues. She was positively terrified of anyone who tried to go near her and if she couldn't flee, she would fear kick until she could escape. She was unpredictable and dangerous. We really had doubts we could bring her back. Through much research, we learned she came from a very prominent show farm in Pennsylvania where the owners and trainers were well known for practices of abuse such as whipping, chains around the legs, ear twitching and other unspeakable abuse. Missy was at a horse show when she was four years old when she finally had enough of the abuse and began to fight back. She turned and kicked a groom in the head and either killed or maimed him. (we were never able to find out for sure if the person died). Somehow, she ended up in somebody's field by herself and not fed. She almost starved to death when a nice young couple took her and saved her life. Unfortunately, they just didn't have the capability to handle such a dangerous horse and, Thank God, she ended up with us. Today, Missy is well adjusted and happy. We use her as a lesson horse and even a pony ride horse. She travels with us to events, parades and horse shows. We completely trust her with a 3 year old on her back. She is one of our most valued team members here at DDF.